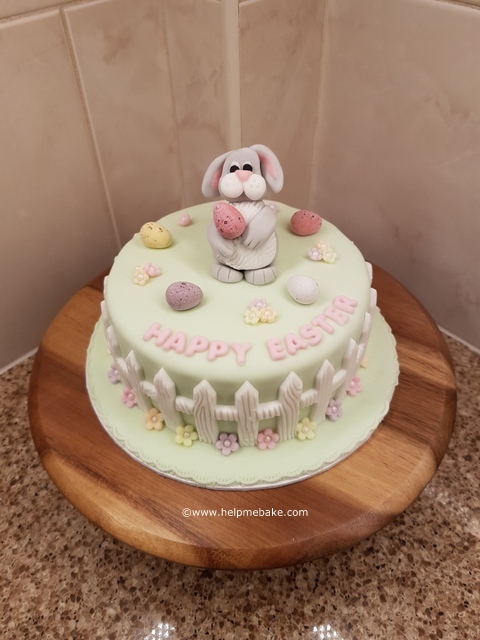 Here is a 6 inch Easter Bunny Cake that I have made for the Easter celebrations. The cake is a Victoria Sponge, covered in pistachio green pre dyed icing, surrounded by a white picket fence. The blossom flowers were pre cut and inserted with white edible dragee balls. The ‘Happy Easter’ writing was made using a Katy Sue mould and the eggs are Mini Eggs. The bunny rabbit was pre made using white, grey and pink icing. Thanks Bill, now that the icing has fully hardened and the cake has settled we get to devour it today! The joys of taste testing. Did it taste as good as it looked Angie ? Yeah Joan it was really fresh, and melt in your mouth. Lol Bill I know I made him wait a full 24 hours before he could have any. I think I'll have another piece today for elevenses. .....second slice eaten today and one final piece left over for Hannah. It still tasted as good as the first piece. PrevPrevHow to soften dry sugarpaste, icing or fondant?